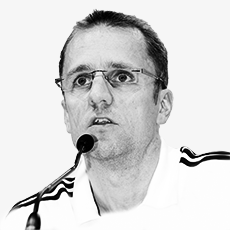 Prof. Dr. Tim Meyer is team physician of the German national football team since 2001. After studying at Hanover Medical School, Prof. Meyer also graduated in Sport Science from the Göttingen University, where he was honored for outstanding achievements in 1995. He received his doctorate from the Göttingen University in 1997, and was awarded the Arno-Arnold-Prize for Sports Medicine for his dissertation “Therapeutic use of endurance training in panic disorders” in the same year. Between 1996 and 2006 Meyer held different posts at Saarland University, i.a. as research assistant to Professor Kindermann. Following his paper “The use of cardiopulmonary exercise testing in sports medicine” in 2006, with which he qualified as a professor, he took over the chair in sports medicine at Paderborn University in 2007. In October 2008 he was appointed to the professorship for sports and preventive medicine at the Saarland University. In 1999 and 2001 Prof. Meyer supervised the U20 national football team at the World Championships in Nigeria and Argentina. From 1999 to 2001 Meyer also supervised the German A2 football team (replacement) as well. In 2005 he was also appointed a Fellow of the American College of Sports Medicine (ACSM).